Press releases starting like that don’t hit the central clearing desk at Art Scatter World Headquarters very often, so of course we dropped everything else and immediately investigated. We’ve been waiting for some exciting poetry news ever since the cat lost his hat. What is this big news? Poetry in Motion is back on track. Regular readers may recall Mrs. Scatter’s lamentation last June over its disappearance, and her call for commuters to take matters poetical into their own hands. The program behind those printed poems posted above the seats on Tri-Met buses and trains, which is administered by Literary Arts, has been on hiatus for financial reasons. Now it’s recruited new sponsors and is ready to rhyme (or not) again. What’s more, you can vote on which poems out of thousands of possibilities you’d like to share your ride with: Vote here. Bus. Muss. Truss. Fuss. Cuss. Deciduous. Now all you have to do is fill in the blanks. Happy versing! Pictured: T.S. 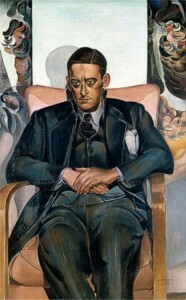 Eliot, painted by his friend Wyndham Lewis in 1938. Lighten up, Tom! You could be rolling on the bus! Wikimedia Commons.